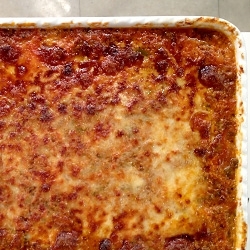 Special thanks to Stacy Pasoni for this “noodle-free,” low-carb lasagna. Layers of yummy eggplant replace the noodles, and the filling is packed with superstar veggies, plus lean ground turkey and a cheesy decadent sauce. Peel eggplant and slice lengthwise into ½ inch thick pieces. Then sauté in 1 tablespoon olive oil. Season with salt and pepper to taste. Set aside. Sauté onion, garlic, green pepper, carrots and zucchini in one tablespoon of olive oil. Once cooked down, add ground turkey and cook until meat is done. Then, add marinara sauce to meat and vegetable mixture. Mix all cheeses, yogurt, and sour cream in food processor. Reserve mozzarella and ½ cup of Parmesan cheese for the top. Heat oven to 350 degrees. Spray 9×11 inch pan with oil spray. Layer eggplant, ½ of cheese mixture, and ½ of meat mixture twice. Cover the top with eggplant, mozzarella cheese, and remaining Parmesan cheese. Bake for about 25 minutes or until the cheese is golden brown.